DALLAS, April 17, 2019 /PRNewswire/ -- Global sports entertainment leader Topgolf® today announced that 50 U.S. venues will offer complimentary group golf instruction classes on Wednesday, May 1 to celebrate National Golf Day. In addition, World Golf Tourtm by Topgolf, home to the world's largest digital golf audience will be offering a tournament challenge to encourage participation in the game of golf on a digital level. Through these efforts, and in partnership with WE ARE GOLF (WAG), a coalition of the game's leading associations and industry partners, Topgolf aims to attract new fans to the sport on National Golf Day by helping people feel more confident in their swing. Guests who register for a complimentary Topgolf Coach class on May 1 will receive instruction from a PGA-certified golf professional along with 50% off their next group class. These special Topgolf Coach classes, taking place at 4:30 p.m., 5:30 p.m. and 6:30 p.m., are tailored to teach the fundamentals of the game in a relaxed and social setting to all skill levels. Last year, Topgolf taught more than 4,300 five-minute lessons on National Golf Day. For those that want to swing a club virtually on National Golf Day, you can join World Golf Tour (WGT) by Topgolf this year by playing a complimentary and special one-day tournament. This quick, nine-hole, closest-to-the-hole tournament on the Challenge at Manele course is a fantastic way to get in a round of golf ? and a virtual Hawaiian getaway all in one! Guests can play as many times as they like in this unlimited play tournament, but the fun will end when the clock strikes midnight on May 1. The top 70 combined scores in each Pro-Tour Champion tier will split the total purse prize. Open to all WGT players, check out the app for additional rules and details. "Topgolf is everyone's game and we are proud to be a leader in making golf accessible to people of all ages and skill levels, through our venues, Toptracer technology, Swing Suite locations, World Golf Tour app and beyond," said Topgolf Chief Executive Officer, Dolf Berle. "We aim to continue to provide awareness around the game of golf and are excited to see everyone take a swing either in-venue or virtually on National Golf Day this year." To sign-up for one of Topgolf's complimentary group golf lessons on May 1, please visit topgolf.com/nationalgolfday and select the desired Topgolf venue and time. In addition, to join the National Golf Day conversation, use #NationalGolfDay and #Topgolf on Facebook, Twitter and Instagram. 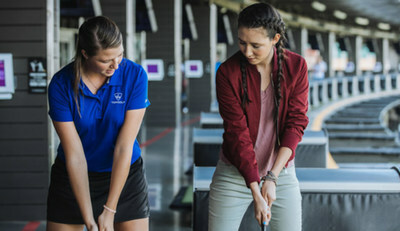 For more information on Topgolf's instruction programs, visit topgolf.com/lessons.